An earthy tan colour with fossil patterns throughout the stone. 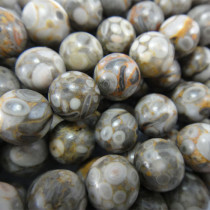 Like Ocean Jasper is part of the Orbicular Jasper family. 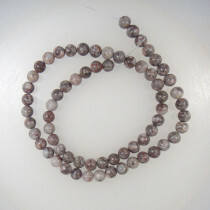 Ocean Fossil Gemstone Round 6mm Beads (~66pce Strand) - 40cm /16'" Strand. 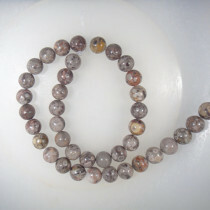 Ocean Fossil Gemstone Round 10mm Beads (~40pce Strand) - 40cm /16'" Strand. 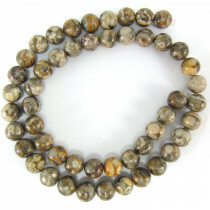 Ocean Fossil Gemstone Round 12mm Beads (33pce Strand) - 40cm /16'" Strand. 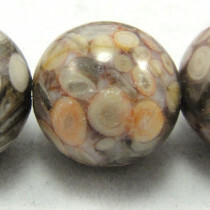 Ocean Fossil Gemstone Round 8mm Beads (~50pce Strand) - 40cm/16'" Strand.